As one of the oldest business case competitions in the world, this annual event draws teams from business schools around the globe and challenges them to demonstrate entrepreneurial flair and business skills, adaptability and teamwork under pressure. During the finals, teams compete head-to-head in each round, analysing a case study for four hours and then presenting their recommendations to a panel of academic and business professional judges. The judges then score each team before deciding on a winner. 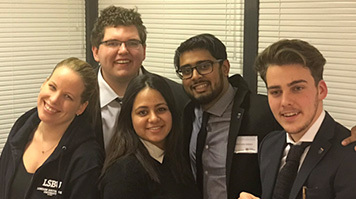 The LSBU team consisted of Miek De Smet (BA Marketing), Zaryoon Sheikh (BA Business Studies), Richard Hart (BA Accounting and Finance) and Naseeba Mhearban (BA Business Studies), and was coached by Jon Warwick, Christina Anderl and Anna Howard, who trained the students for four months in preparation for this challenging competition. “The whole thing was a fantastic opportunity to say the least,” says Zaryoon. “Once we found out we had been invited to compete in Finland, that’s when the intensity of training kicked up a gear. Anna, Jon and Christina began to dissect our presentation styles and content for scrutiny, to perfect every aspect of our individual and group processes. Once we got to Finland, we felt that we had learnt everything we could, and it was time to show what we could bring to the table. The team performed exceptionally well in securing a bronze medal, beating rivals Leeds Beckett University (UK), International Business Academy (Denmark) and Rotterdam University of Applied Sciences, (Netherlands). LSBU was eventually eliminated in the semi-final round by the competition winners Carlton University (Canada). Enjoy the experience… and be yourself! With the whole experience proving so successful for the four students and the university as a whole, what do Zaryoon and Naseeba feel they gained from taking part? “My experience has really opened my eyes to the business world and where I want to go in my career,” says Naseeba. “My NIBS experience taught me a lot, including how valuable an idea is. As a result, I have decided to launch my career in the IT industry as a consultant and will be starting up my own business idea called Smarket. Anna Howard comments on the overall achievements of the team, "All three coaches were so very proud of the achievements of the team. Up against some fantastic universities and to come away with the bronze medal was outstanding. It was an incredible experience for both students and staff."